Truly, SeaWorld seems like a world in itself. That the aquarium-amusement park hybrid offers an experience unlike any other explains its success since 1964. 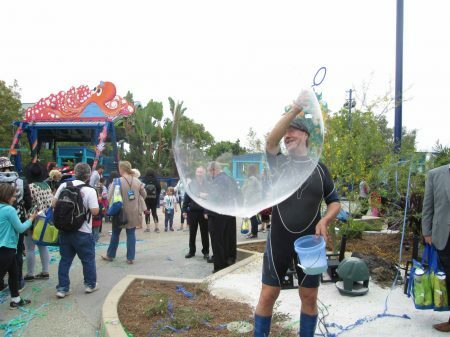 Surrounded by ambient piped-in music, bubbles, and sundry other artifices, visitors can watch shows, ride roller coasters, play with animals, and immerse themselves in huge aquariums, all in the same day. 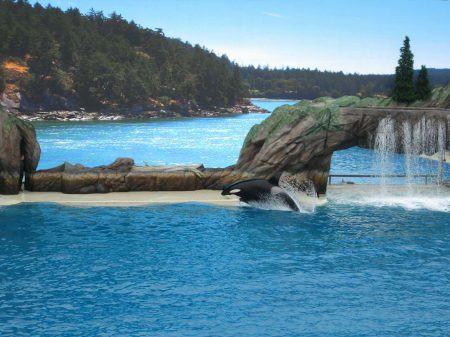 These diversions, while multifaceted, center on live marine mammal exhibits and shows. Once a prestigious exemplar of aquatic entertainment, SeaWorld is now struggling to survive. Slowly, the embattled chain is submerging under governmental and activist pressures against what is viewed as animal cruelty. Yet the blissful crowds petting small sharks and watching glistening dolphins perform aerial flips on a recent afternoon at SeaWorld San Diego seemed oblivious to the precariousness of their entertainment. 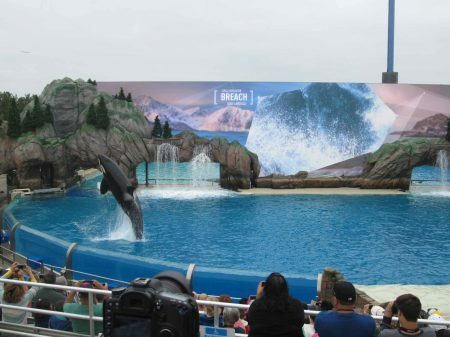 Last week was my first visit since 2007, less than three years before an orca killed trainer Dawn Brancheau during a 2010 Orlando performance, triggering the beginning of stricter governmental restrictions on SeaWorld’s orca shows. Three years after that, the movie Blackfish was released, stirring up the already-simmering pot of public sentiment into an anti-SeaWorld feeding frenzy. Organizations like PETA, Humane Society, and Nonhuman Rights Project launched a full-scale campaign against SeaWorld, arguing that confining killer whales is abusive. Their agitations, protests, and celebrity boycotts, along with anti-SeaWorld books and lawsuits, eventually led to more regulation. Last year, California passed laws prohibiting captive orca breeding; and federal bills have been introduced to make it illegal to keep orcas at all. SeaWorld responded by announcing that it would stop breeding orcas at all its parks; the extant specimens would be the last in captivity. It also decided to overhaul its killer whale performances and partner with Humane Society, which wants SeaWorld to eliminate all of its marine mammals. I’d long wondered how SeaWorld would weather these controversies. Attending the largest media event in park history seemed like an ideal opportunity to find out. 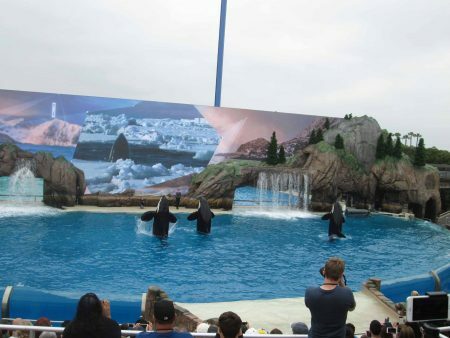 On Wednesday, May 31, SeaWorld launched its nascent transitional era, debuting several fresh rides and a killer whale show titled “Orca Encounter.” The expenditure of $175 million, the most in SeaWorld’s history, manifested the chain’s recognition of the urgency to adapt to changing mores. These attractions underscored SeaWorld’s drowning roots of success and highlighted the privation imposed by imminent new restrictions and the future transformations they inevitably imply. Brightly painted and embellished with briny motifs, these rides are visually interesting, but mostly child-oriented; and fundamentally no different than similar rides at other theme parks or even carnivals. The new sector’s most salient feature is optical flair. Themed aquariums allow toddlers to go underneath and around tanks for atypical views, and beautifully complement the nearby rides. 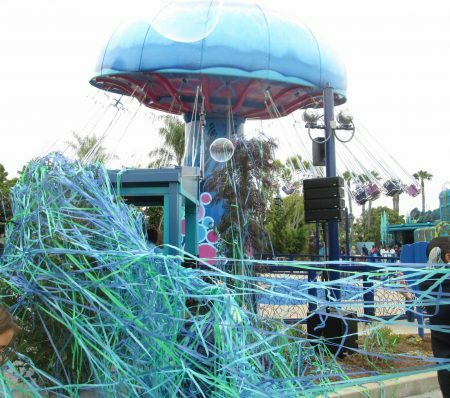 However, these relatively small animal displays seem like afterthoughts when compared to the new rides, which in turn seem insignificant compared to other, older attractions. 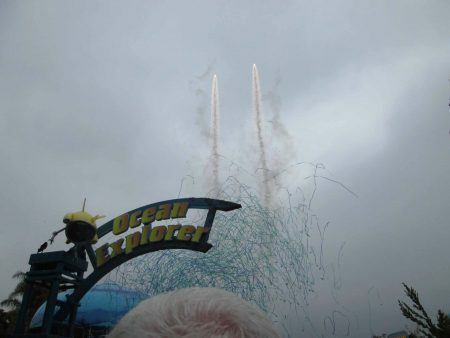 Ocean Explorer is archetypal of SeaWorld’s increasing focus on mechanical attractions and catering to children, and lessened emphasis on animal shows and exhibits appealing to all ages. Given mutating cultural attitudes towards animal displays, rides are perennially more reliable attractions and a more sustainable long-term focus for a theme park. But this pedestrian new section of the park also betrays that SeaWorld’s crown jewels are its animals. Expansive, intricate exhibits and shows featuring live sea creatures are what distinguish it from competitors. 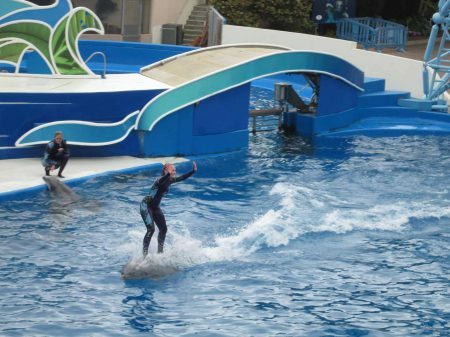 SeaWorld’s signature killer whale show has traditionally been the highlight of any trip. Besides the Miami Seaquarium, SeaWorlds are the only parks displaying orcas. As the media group approached the killer whale stadium (formerly the Shamu Stadium), orcas could be glimpsed swimming in pools many yards below. Even viewed from afar, there is something awe-inspiring about these magnific monochromatic beasts. Being on the verge of witnessing the beginning of the end of their storied performances imbued the sensation with particular poignancy. While we filed into the stadium, a monolithic screen, accented by fake trees and rocks resembling craggy Pacific Northwest seacoast, played various morphing ocean scenes. This alone was arresting and appeared much higher-budget than previous configurations. We soon discovered why. Rather than merely supplementing live animal theatrics, onscreen videos often supplant them. 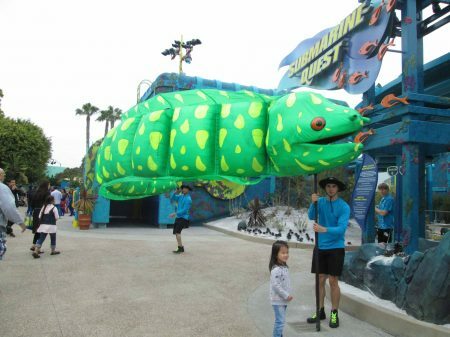 This revamped show is supposed to be more “educational and natural”1 than previous productions, which focused on loose storylines centered on the character “Shamu,” SeaWorld’s former mascot, and featured the whales performing feats on their own and with trainers. By contrast, “Orca Encounter” shows the whales demonstrating only behaviors ostensibly performed in nature, and incorporates comparatively little trainer interaction. In fact, the whales themselves are less prominent in this new show, being overshadowed by the 140-foot video screen backdrop showing mere films of orcas and didactic text that compete with live animals for the audience’s attention and often win. Considering that the whales are being phased out, the artful de-emphasis of live animals is certainly understandable. SeaWorld is lessening its reliance on the creatures whose health is all the more germane since they are now irreplaceable. Heavier on technologic effects and lighter on live theatrics, this show sets the stage for its own sunset with that of the orcas. It made me consider what made previous shows so effective. Seeing orcas interact with trainers gave viewers a sense of their relative scale and strength, and showed how insignificant humans seem when compared with these colossal creatures. Of course these shows were artificial; but the ‘unnatural’ tricks demonstrated the behemoths’ might in ways that people could relate to. While it should be obvious that orcas don’t cavort that way in the wild, it is amazing that these predators can be trained at all. In light of the fact that in nature, they knock seals and sea lions off ice floes before killing and eating them, it’s surprising that more trainers weren’t killed or severely injured. That so few were is testament to how incredible these whales are, especially in their capacity to learn and relate to people. Large aquatic mammals need to be seen dynamically, in and out of the water, as in these shows, in order to understand them and their capabilities. Three whales demonstrate a hunting technique called spyhopping. The media event concluded with the orca show, leaving the afternoon free to explore. Secondary highlights were the rollicking dolphin and sea lion productions. These still focus on trainer-animal interaction, often attributing humanlike characteristics to the animals while disporting the creatures’ unique abilities. 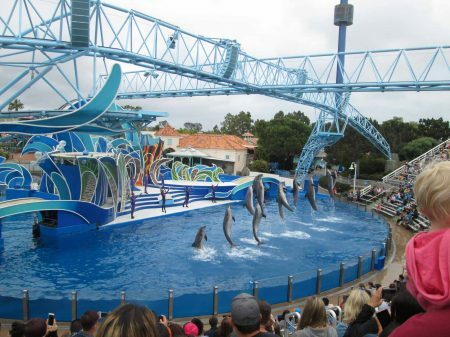 Watching SeaWorld’s other shows made patent what a major transformation “Orca Encounter” represents. In comparison to “Orca Encounter,” the dolphin and sea lion shows’ flamboyant costumes, histrionic acting, idealistic scripts, and celebration of animals’ theatrical tricks, while entertaining, seemed outdatedly campy. How would SeaWorld be without its dolphins and other marine mammals? Other businesses of a similar nature have closed. Last month, after over 100 years in business, the Ringling Bros. and Barnum & Bailey Circus shut down, citing dramatic drops in ticket sales since eliminating elephant acts following new laws and provocations by the same agitators fighting SeaWorld. Campaigns against keeping large mammals such as elephants and orcas are only the tip of the iceberg of a multi-pronged movement against all animal captivity, including zoos. 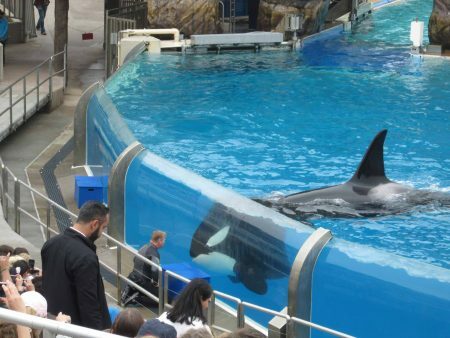 It’s hard to deny that captivity is rarely ideal for individual animals. Even dogs don’t like being imprisoned. However, most people with an interest in animals, whether staunchly for or against SeaWorld and its ilk, agree that conservation is important. As human populations increase, it seems that we are as much, if not more, of a detriment to wild animals, destroying their habitats and killing individuals, as we are to captives. One way to combat this is by engaging public interest in animals and promoting misunderstood species in ways that people can relate to, thereby replacing negative attitudes with positive ones. 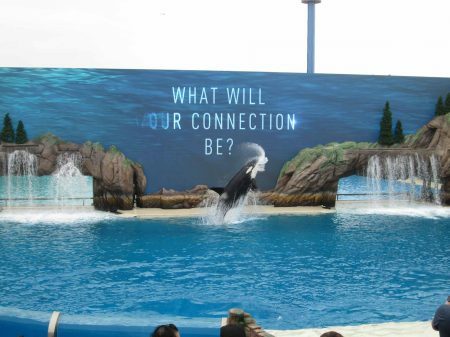 SeaWorld does this with its live animal shows—perhaps too effectively. The connection will regrettably rupture with the death of SeaWorld’s last orca. Ironically, SeaWorld set the foundation for its own demise. Whales are one of many animals that have long been feared and disliked. If it weren’t for SeaWorld’s decades of high-profile shows that glorified and even personified whales, would masses care about whether or not the animals were mistreated? It seems not. Dwelling on negative aspects of SeaWorld overshadows the fact that it already rescues and rehabilitates stranded and injured wild animals at an average of more than one per day over the last 50 years.3 More importantly, anti-captivity activists overlook the potential of captive populations as conservational assets. Captive breeding programs have helped successfully re-populate endangered species like the California condor. Dissolution of captive orca breeding programs will not only curtail captive populations, it will stunt development of knowledge about orca husbandry and propagation techniques that could offset the destruction of wild populations were orcas ever to become endangered. Prohibiting the captive breeding of orcas and other marine mammals may be a short-term victory for activist groups; but long-term, their actions will likely lead to deleterious defeat of the very animals for which they profess great concern. As Joan Didion observed, “We tell ourselves stories in order to live.” These narratives constantly change as society reinvents them to justify its mercurial desires. In the case of this SeaWorld controversy, three notions remain constant: the world revolves around human ambition; despite pretensions to the contrary, people lack understanding of other organisms; and no one has a satisfactory solution for compromising human interests, including love of animals, with the interest of all other species whom we inevitably dominate, wild or captive. What will be the consequences of throwing the orcas out with the pool water? 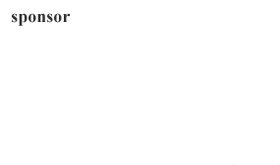 1 As stated in https://seaworldcares.com/en/Future/, and press releases. 3 According to SeaWorld employees and press releases. Also see: https://seaworldparks.com/seaworld-sandiego/media-room/~/media/25898ec34455484ca0d34ae228b7c7d0.pdf.